I trust that no one has spent the last twenty months anxiously waiting for the next post on this blog. Things got busy… and then we started communicating via other channels.. and now I’m about to start a job at another University, so I’m actually just posting a brief entry in order to wind this blog up. When I lasted wrote here, we were about to go to Blackboard Managed Hosting. There were a few technical glitches in transferring our data to Blackboard’s servers, but once the transfer was complete I’d say it has been nothing but good news. We had long recognised that if the use of TEL and Electronic Marking & Assessment were ever to really take off at the University, having a dependable VLE would be a prerequisite. Since moving to Managed Hosting, the University of West London has had a reliable, responsive VLE, and it really has made a difference. Since the move to Managed Hosting in May 2013 there have been only two periods of unplanned downtime. Both of those were the result of denial of service attacks on another institution’s web space, and in each case Blackboard restored our service within a couple of hours. We have received very good support from Blackboard; patches and other fixes which required a service restart have been carried out at periods of low demand, in the middle of the night; and the major upgrades in August 2013 (from SP9 to SP13) and August 2014 (to the April 2014 release) were each completed within 12 hours (system shut down by Blackboard at 7.30 pm, and the updated system ready to be tested by the time UWL staff got up next morning). The April 2014 release also brought some really good features, especially in relation to assessment processes. Indeed I personally feel that Blackboard now offers a number of advantages over Turnitin (still the most used system for submission and marking at UWL). Turnitin has made big improvements in the last year or so, but the fact remains that it still doesn’t properly support UK universities’ assessment processes. And it has a tendency to suffer serious technical problems every few months – always at times of peak demand. Other TEL systems recently made available at the University of West London include: Panopto for personal recordings and lecture capture; and the PollEverywhere online polling system. Meanwhile Matt Lingard took up a completely new post of Head of TEL, while for the first time in over two years all the advisory posts supporting academics in the use of TEL were filled. See details of the current team at http://www.uwl.ac.uk/instil/our-team. There’s a new staff support site too at www.uwl.ac.uk/telsupport – although you need to have a UWL account to access that. And I believe that there will be a new publicly visible blog for INSTIL (the University’s Institute for Teaching, Innovation and Learning) coming shortly. I’m looking forward to reading about my former colleagues’ activities as I move on to my new role. IT Services will shortly be migrating our virtual learning environment (VLE) Blackboard to an externally hosted solution. This will give us the ability to provide a more reliable Blackboard environment on more resilient hardware. The new system is hosted by Blackboard in the Cloud. In order to bring in these improvements, we will need to migrate our onsite VLE to the new system. This will mean that from 04:00 Friday 26th April 2013 to 23:59 Sunday 28th April 2013 Blackboard will be in a read only state. During this period you should not make any changes, send out messages, upload new content or mark work online. We hope to have the service fully operational from Monday 29th April 2013, when you will be able to access the new Blackboard site using the current address, http://online.uwl.ac.uk . Please note that no software upgrades are being applied as part of this migration, so the new hosted system should look and operate exactly the same as the current live version. We apologise for this interruption to service, but have planned the downtime for a period which should inconvenience the fewest users. We are confident that the upgraded system will provide an improved service for all our student and staff users. If you have any questions or concerns please contact the IT Service Desk on extension 2222 or externally on 0300 111 4895 or e-mail itservicedesk@uwl.ac.uk or via Twitter (@UWL_ITServices). I was one of the co-signatories to this message, along with the Director of IT, but I’d like to add a few personal comments and observations to expand on this somewhat formal communique. First of all, I think it’s really good news. Blackboard is a complicated suite of software, requiring high level server maintenance and database management skills. We have a number of highly skilled IT staff, but they’re not Blackboard specialists – they also have to look after the student records system, the finance system, the HR and payroll systems, staff email etc. etc. Whereas the staff who work for Blackboard Managed Hosting have no other role – their only job is to fine-tune the servers, to manage backups and maintenance jobs, and to make sure that the Blackboard systems they look after are working. This is not to say they guarantee 100% availability – no hosting service would offer that – but I am confident that this move will result in an improved service, and a more reliable VLE. Being hosted by Blackboard will also ensure that we stay more up-to-date with new releases and service packs. We won’t ever adopt a new version as soon as it has been released – that would be foolhardy – but we will be looking to stay within a couple of versions of the latest release. That’s not just to take earlier advantage of new features, but to get the bug fixes which each service pack brings. Up until now the entire upgrade process has been managed in-house, and takes a phenomenal number of person-hours. That’s one reason why upgrades happen fairly infrequently. From now on, the Technology Enhanced Learning team will be testing new versions – making sure we know how they work, checking which components we want to enable and which settings to apply, and assessing the pedagogical benefits and applications. But Blackboard themselves will look after the technical side of things. It should also mean that when we do apply upgrades, we need less downtime than at present. Finally – for this post at least – I think there is a real benefit to having committed ourselves to remaining with Blackboard for the next few years, since this brings stability. No VLE is perfect, and no VLE will ever please all the people who have to use it – no doubt there are features of Moodle and Sakai which some of our lecturers and students would prefer. But equally, Moodle isn’t the all-singing all-dancing panacea which it is sometimes made out to be. Blackboard is still a market-leading product, across the world. It has plenty of rich functionality, much of it still to be fully explored and exploited at UWL. Rather than devoting months to choosing a new system, many more months customising , testing and deploying a new system – and then having to retrain all our users – we can get on with using the tool we already have to its best advantage. Without worrying that next year, or the year after, we’ll all be using something different. Meanwhile, assuming you’ve read to the bottom of this post, let me remind you once again that, this coming weekend, Blackboard will be in a read-only state while we migrate all the data across to its new home in the Cloud. How do I cite a YouTube video, or a TV advert, or a podcast? …or a computer game, a film trailer, or an extract from a radio programme? does it make a difference if it’s on a DVD or CD or on the web? 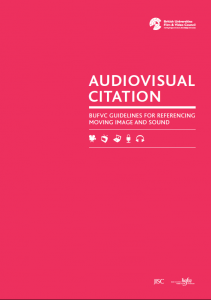 The British Universities Film & Video Council (BUFVC) has just published a set of guidelines to help students, academics and researchers reference the growing diversity of audio-visual materials in this digital world. Have you ever wondered how to cite a television advert? Or what about an extra from a DVD? Do you ever need to provide advice to students or contributors about how to reference audiovisual content within their own work? The British Universities Film & Video Council (BUFVC) has today launched a pioneering set of guidelines to help answer all these questions and more.Despite the exponential increase in the use of audiovisual material in teaching, learning and research in higher and further education, existing guidelines for the referencing of moving image and sound are often insufficient as they are based on standards developed for the written word. The newly launched guidelines are practical, accessible and applicable to a wide range of different users across all disciplines. They encourage best practice in citing any kind of audiovisual item and cover film; television programmes; radio programmes; audio recordings; DVD extras; clips; trailers; adverts; idents; non-broadcast, amateur and archive material; podcasts; vodcasts; and games. In the era of YouTube, podcasts and vidcasts it is crucial for students, researcher and academics alike to be able to cite these sources clearly and ensure references can be traced back unambiguously. And here’s my first attempt to use the guidelines, to reference the Volunteering Team’s UWL Harlem Shake for Red Nose Day. Given Title or ‘Track title’, Main Title [type, format] Production credit. Production Company/Sponsor/Private, Country of production, date created/uploaded/published. Duration. Start-end timings of extract. [release information, e.g. production company, catalogue number, date of specific edition] or point of access, e.g. original web URL (date of access). UWL Harlem Shake for Red Nose Day [user-generated content, online] Creat. UWLVolunteeringTeam. 12/03/2013, 2mins 42secs. http://www.youtube.com/watch?v=u7GCMeuo2xc (accessed 27/03/2013). No not the Glam Rock exhibition at Tate Liverpool – in this case GLAM stands for Galleries, Libraries, Archives and Museums. global network of people and organisations who are working to open up content and data held by GLAM institutions. I’ve only just discovered Open GLAM but their website at http://openglam.org/ has links to some really interesting digital tools and collections. openly licensed datasets from several cultural institutions. All collections provide digital scans or photos that can be freely used without any restrictions. Most of the objects are in the Public Domain because of their age, or are licensed under an open Creative Commons license (CC-BY/CC-BY-SA). These include the online collections of formal Art galleries such as the US National Gallery of Art and the Yale Center for British Art, the Library of Congress Prints & Photographs Online Catalogue and some sites of more niche interest such as The Digital Comics Museum and Public Domain Superheroes. Their Culture Labs page, meanwhile, has links to a range of open source tools for working with digital content: particularly for annotating, sharing and citing digital resources, but also tools to generate timelines or to assist with crowd-sourcing activities. You’ll also find information on the new release on the PebblePad3 News Blog. There’s a link to the staff guide – and of course other help for tutors – in the PebblePad area on Open Door. PebblePad will be applying an update later tonight, which fixes some bugs, restores a few features which were in Classic but hadn’t made it into the first release of PebblePad 3, and brings some really nice new features. In ATLAS there are a range of changes which will make it easier for staff to manage workspaces, find the student submissions they need to view, and mark / provide feedback. I really like the new ability to use a webfolio page as the “About” page on a workspace. Put baldly like that, that may seem like the sort of thing which excites us learning technologists more than others. But what it means is that you can now make the ATLAS workspace look much more attractive to users, and more importantly, use the workspace itself to provide a whole range of useful resources for students. The ability to export grades from ATLAS workspaces – something you could do in Classic – is also being reintroduced with this upgrade. The big new feature, though, is the introduction of “Workbooks”. The release notes say “Profiles created in ‘Classic’ can now be edited as workbooks” and that’s important – if you had built Profiles in the old version it will now be possible to use and edit them in PebblePad 3. But more than this, Workbooks will, I think, make possible some really major changes to the way we provide students with webfolio templates to customise and complete. I won’t go into details now, if for no other reason than I haven’t had a chance to experiment with them yet. But it looks to me that Workbooks will turn out to be a much more flexible tool than anything we’ve had previously – in PebblePad or indeed any other system (Blackboard or Office 365 for example). Following the recent brouhaha over Instagram’s apparent (and now retracted) claim to the right sell its users’ photos, JISC Legal have drawn attention to a really useful guidance paper Pinterest, Image Sharing Websites and the Law. This highlights the legal implications of using image sharing websites such as Pinterest, Instagram, Flickr and Facebook, with particular emphasis for their use by staff and students in Further & Higher Education. The story, as usual with Web 2.0, is neither all good nor all bad – but this guidance paper is well worth reading to familiarise yourself with the issues involved.